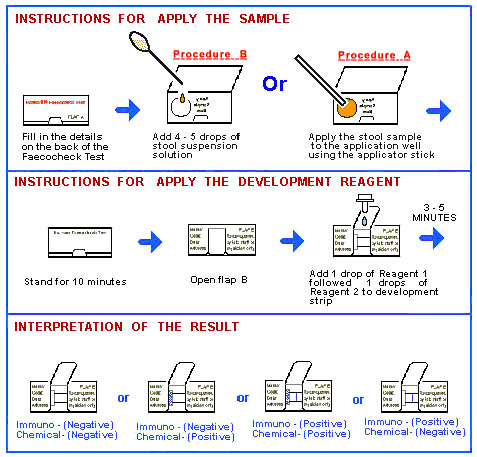 The Hanson® Faecocheck Test is an easy to use, contains of both immuno-test and chemical test. The monoclonal immunoassay is major for the Lower GIT screening and designed to provide a qualitative analysis of human haemoglobin in faecal samples. The chemical test is major for the Upper GIT screening and designed to provide a qualitative analysis of human heme in faecal samples. The Faecocheck Test combined immunoassay and chemical test in the same device as an all-in-one faecal occult blood screening test. The test is intended for use by medical laboratories and physicians. The assay should not be attempted without proper supervision and is not intended for over the counter sale to laypersons. The Hanson® Faecocheck Test is a screening test providing a preliminary analytical test result only. It should be used in conjunction with other tests to properly exclude the presence of gastrointestinal tract (GIT) pathologens. Any positive results should be promptly followed up using more definitive tests such as colonoscopy or barium enema X-ray. Patented in USA、China、Taiwan and pending in countries. The Hanson® Faecocheck Test is an affordable, qualitative screening test used to identify individuals, asymptomatic or otherwise, for further investigative testing. The detection of faecal occult blood who will need a indicates GIT bleeding. Although some daily blood loss to the GIT is normal (1), excessive bleeding is an indicator of a range of pathological conditions from insignificant to potentially fatal. It is through the early detection of faecal occult blood that the effects and progress of serious pathologies such as polyps, diverticulae, ulcers and colorectal cancer may be reduced or removed completely. The Hanson® Faecocheck Test combined immunoassay and chemical test in the same device. The immunological aspect of the Hanson® Faecocheck Test uses a membrane bound monoclonal anti-human haemoglobin antibody to specifically bind human haemoglobin in faecal samples. The specificity of the antibody for human haemoglobin eliminates the possibility of false positive results stemming from heme(hematin), dietary sources of haemoglobin and dietary peroxidases. Once bound to the monoclonal antibody the hemoglobin’s pseudoperoxidase activity is utilized to produce a blue coloured end product. The reaction involves the oxidation of alpha guaiaconic acid by the catalytic action of haemoglobin in the presence of peroxide. The product of the reaction appears as a localized blue line on the test strip. The appearance of such product constitutes a positive reaction. If no haemoglobin is present in the sample or the amount present is less than the minimum detection limit of the test, no coloured end product will form and the result is deemed negative. The immunoassay is major for the Lower GIT screening although some of haemoglobin will through stomach into intestinal tract (2). The chemical aspect of the Hanson® Faecocheck Test is designed to detect human heme that digests from upper GIT bleeding. It also uses the pseudoperoxidase activity of heme groups to produce a blue coloured end product. However, without the ability to selectively bind human haemoglobin, all haemoglobins (human or animal), partially denatured haemoglobins, and individual heme molecules will produce this coloured end product. This lack of specificity, which is so often the cause of false positives particularly when one uses the chemical testing method alone, is used by the Hanson® Faecocheck Test to indicate bleeding originating from the upper GIT. That is, by being able to detect the presence of heme groups and other products of human haemoglobin that have been partially digested by the stomach and the test can compare the bleeding originated from the Upper GIT with whole haemoglobin associated with lower GIT bleeds.